Someone you know has a birthday. Did you buy them a present - or create one for them? Yes, you did? Good, now all you need is a great message to go with it. No, you didn't get (or create a homemade) present for them? Well, writing birthday greetings is one of the best (and cheapest) ways to give someone a heartfelt (and cheap) present that you can be sure (you hope, you cheapskate) that they will like. (Actually no one likes a cheap present, oh wait, some do, but no one likes a cheapskate, oh wait, no, sorry, no one likes a cheapskate, but a lot of good folks probably like you in spite of you being a cheapskate, if indeed you are - all the more reason to make your birthday wishes creative, fun and personal). While birthday wishes and messages may or may not be the best thing that you can give them, you may find that they will come to appreciate some sincere, funny, foolish, or heartfelt birthday greetings. It may be an investment of your time, but no matter if you have a present for them or not, it will still be something nice that you can do ... and you know what? Time doesn't always equal money, time can also equal love! And if by some strange coincidence you DID buy them a present (or decided to go with homemade gifts), adding birthday messages is a great idea. But it DOES matter what KIND of birthday message you come up with. 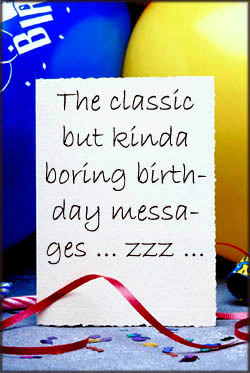 While these birthday greetings are usually fairly sincere, they are present on almost every store bought birthday card (the boring type, not the humorous birthday cards), and so most people get bored, or even pretty sick and tired of these same-old, same-old birthday greetings, and you too will realize just how stale they can get if you write them on birthday cards year after year (or if you are on the receiving end of them). First you forget names; then you forget faces; then you forget to zip up your fly; and then you forget to unzip your fly. Exactly how far along the process are you? Happy Birthday, Whats-yer-face! I know you have a birthday, but as a true friend I have no idea of your age, I just know you're young and wonderful! Happy Birthday! You're not getting older ... just wiser and more distinguished! We all grow older and wiser all the time, but you ... you've got the smart without looking the part! In order to be able to write a good birthday message on a birthday card for a friend, you may consider learning a bit about creative writing. It may look like the four tips are actually three, but you have to remember that #1 is so important that it is placed there twice to pound it into your head. When you sit down to write birthday greetings, you may forget what you wrote last year on the person's birthday card. Thus you will end up writing the same "funny" line for the "hilarious birthday cards" that you give each person year after year. Few women admit their age. Few men act theirs. So when you act like you refuse to even admit you have a birthday that makes you really special. So, no matter if you're organized or not, you'll want to write something different every year (no, changing a single word or two doesn't count). If you don't know what to write, it is important that you find a way to get creative. Learning about creative writing means learning how to activate your brain and get creative with it. Or, it means finding original stuff on websites like this one, and perhaps combining and mixing that stuff up in new and creative ways. Look for a few sources of inspiration (like this page and the other birthday pages on Quotescoop.com) to help you come up with something that is funny, witty, creative, and original. Wishing you all the best this year. While these lines are definitely old classics, note the words "old" and "classic" that indicate that these birthday wishes are definitely about to kick the bucket (kind of like that 56' Bronco that you, if you're a guy, have in your garage and your spouse desperately wishes you would get rid of). Have a great birth today! Wishing you all the congratulations this best! Best you all the year! May this be the best year yet ... and congratulations on buddy being happy to celebrate young dreams to be a special, perfect old party of wonderful! Best Birthday, Big Bad Beautiful Buddy! Wishing you love and happiness as you turn sixteen. That's sixteen Celcius, of course. You may think that all this seems like a lot to go through just to write a few birthday greetings, but it is much better than suffering through a fake smile someone plasters on their face as they get the same Cuddly Birthday Bear card for the 15th year in a row, right? So, instead, get out your favorite joke or funny book (Dave Barry is usually magical), and start reading some of the funnies. Spend just a few minutes warming yourself up before you even try to compose those new, unique birthday greetings. 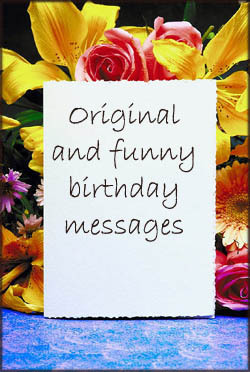 These humorous birthday quotes can help to inspire you and give you some great ideas of things to put on your birthday card. Plus, laughing a lot will also help to make your handwriting kind of squiggly, and there is a chance that it will come out looking like elegant calligraphy (okay, so maybe you don't need to hold your breath about that one). Once you have warmed up with reading some birthday humor, it's time to get down to the hard work of drinking a bit of alcohol. (Please skip this step if you are underage, part of AA, a Mormon, or someone who just shouldn't or don't like to drink). Yep, that's right. Trust us when we say that writing birthday messages with a bit of beer or wine in you is always a lot more fun, and the resulting messages - or birthday speeches - are always a lot funnier (at least for you). Of course the person who receives the speech "Beer is 6% alcohol and BLEAAARGH …" as their birthday present may not be too thrilled with the extra care you took to make it special. In this case, just a single drink (or maybe two; three if you're very large) can be just what you need to get your mind whirling (it will definitely be spinning even if not from inspiration). People are like red wine ... Some turn to vinegar, but you just improve with age. ... and leave it at that. Now that you have warmed up your hand by opening that bottle, your sense of humor with the funny birthday messages, and your mind by pouring alcohol into it, you are ready to actually get down to the even harder work of writing the birthday message. Of course, right about now you probably realize that you have forgotten a pen and paper, so take a moment to go do that. Now you're back, and you're ready to write. What the heck comes next? Ah yes, the birthday message. Get out your paper and your pen, and start doodling on the paper to come up with some ideas for funny birthday greetings. Maybe write down the three funniest birthday jokes and/or funny birthday quotes so you have a starting point. Then, combine. Mix. 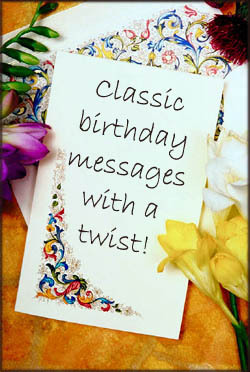 Stir up those birthday jokes or birthday quotations to make a new one, never seen before. Either that, or you can just run to the store and purchase some humorous birthday cards from the stationery section. No, we don't mean for you to use those birthday cards directly, not unless you have to. Happy birthday to you. Look forward to a fun future with friends. Oh, and I'll try to make it when I can. Writing the wrong birthday message is almost as bad as forgetting a birthday present (you forgot didn't you?! ), so be careful of what you actually put on the card. Write a rough draft first. Or, even better, several rough drafts. The card you end up with should probably be mildly (or: very) funny, but it shouldn't say something that is too offensive - depending on the recipient, of course. Your birthday messages can pretty much say whatever you want, but be wary of straying from the sarcastic and funny territory deep into the slanderous and offensive territory. Your birthday again? Dammit, why does this keep happening year in and year out? Having a birthday again? Careful about doing that. If you do it too often you may end up cashing in your chips! Your birthday (again): One more year of existence down the drain. Happy Birthday! Yeah, yeah, big deal, it's your birthday. Why do we make such a big deal out of it when it's not even a national holiday? Man, I can't wait until you finally croak, Grandma, as I REALLY want that inheritance! I got this card and wrote this stupid message because my mom made me. Remember, offensive is not the idea (unless you are actually trying to offend, and, if so, it may cause you to wonder why you're invited to the party anyways. ARE you in fact invited to a party? If not, you may want to reconsider your choice of birthday messages). Relax and have fun with writing the card, but if you hate writing and you took our not-very-healthy advice about having a drink, don't let the alcohol or your annoyance dictate too much of what you are going to write. The idea is to be funny, but be wary of trying to be too funny (and, of course, of telling that same old joke over and over again every year). Still haven't bitten the big one, huh? Well don't worry, one day you will. Until then: Happy birthday! Having a birthday again? Well, okay, but don't make a habit of it! This is your special day and who knows, it may be the last one. So please: Enjoy it! Another year gone by, and hey, you still haven't kicked the bucket! Happy birthday! Now that you know what not to do (though in all fairness you probably didn't need to be told what not to write, but we had fun writing all that stuff), it's time to get down to the things that you actually SHOULD include in your humorous birthday cards and funny birthday messages. Writing great birthday messages has a lot to do with being honest, loving and sincere, a lot to do with being slightly funny, and, barring those too-close friends with whom you are constantly being offensive anyways, it has nothing at all to do with offending the person. If you are going to poke fun at the person who is suffering through another year of stale birthday cards and completely unwanted birthday presents ("Oh, look, another woolen sweater! I'll treasure this and wear it always despite the 110 F Arizona heat! "), make sure to do it in a way that they will actually come to enjoy. You are a blessing in disguise, my friend. I will stay with you forever and ever, or at least until the birthday cake is eaten. Thank you for these 10 years of friendship, and for the 20 years of acquaintanceship. You used to jump off the couch, jog five miles and end with a snack in the kitchen. Now you use a short cut to the kitchen. Happy Birthday Old Timer! You have always been there for me, even when I really didn't want it. You can always lean on me, but I may lean back (and I weigh more). These are all hilarious birthday greetings that you can add to your birthday cards, and you may just be able to find a great card that has the exact illustrations and pictures that you need to make these birthday messages unforgettable. If not, you can also make one yourself, using birthday clip art - or even make a drawing of your own, for a totally unique birthday cards. Can't draw? Who cares? It's the thought that counts! Remember, tailor the message to the person who is getting the card. Your 5 year old will have no idea what it means to be "over the hill rather than buried under it", while Grandma may not understand the Snoop Dogg-themed birthday cards. Birthday humor is always a lot of fun, and there are in fact people who make a living from providing it (yes siree, being a professional writer of greeting cards is a job you can aspire to!) ... which is why so many people buy the funny birthday cards at their local grocery store or some such place. They're funny in a professional way, or some of them are. (We saw one that, on the front page, asked how you make an idiot accept a postponement and on the inside answered 'I will tell you later'). Scientists have found a strong correlation between the number of birthdays you have and your life expectancy. Here's to your growing life expectancy! Losing some of your visual acuity as you get older is nature's way of hiding all of the wrinkles that you would see when you look in the mirror. At times is it seems that I am living my life backward, and that at the approach of old age my real youth will begin. My soul was born covered with wrinkles - wrinkles that my ancestors and parents most assiduously put there and that I had the greatest trouble removing.